This section provides the overall procedure to create a new schedule for a report procedure (FEX). Some steps in the procedure contain details on the associated options, while other steps direct you to a separate section that contains detailed descriptions of the options and additional information, such as tips in making a selection. Open the Advanced Scheduling tool, as described earlier in this section. In the Properties tab, you can edit the name for the schedule Title box. This is a required field and is blank by default. In the Summary box, type a descriptive summary. Select a Job Priority Level. Normal - 3 Job Priority Level is the default. Select the Delete this schedule if it is not scheduled to run again check box if you want this schedule to be deleted if it will not run again based on its Recurrence settings. Use this option if you do not plan on using this schedule again. Leave the Enabled (Scheduled job runs at specified time) check box selected if you want scheduled jobs to run as you have specified in the Recurrence settings. Make the following selections in the Recurrence tab. 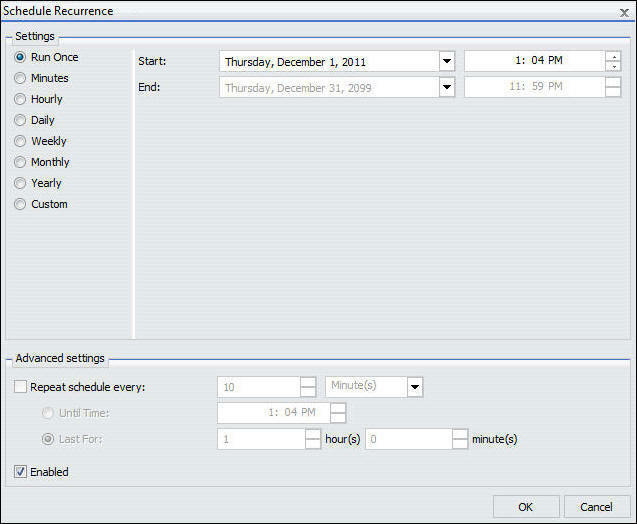 The Schedule Recurrence dialog box displays, as shown in the following image. From the Settings radio button list, select the run interval that the schedule will use to run. You can set the interval to Run Once, Minutes, Hourly, Daily, Weekly, Monthly, Yearly, or at Custom intervals. Select the Start date (from the drop-down calendar) and time you want the schedule to begin running. Note: To change the time setting, select either the hour or minutes and use the arrows to increase or decrease the value. If applicable to the run interval selection, select the End date and time to specify when you want the schedule to stop running. If applicable to the run interval selection, from the Advanced settings, click the Repeat schedule every check box to enable custom intervals. In the Tasks tab, the fields are populated according to the Task type you select to schedule. For example, if you select to schedule a WebFOCUS report, the Path and Procedure are populated according to the procedure (FEX) information stored in the WebFOCUS Repository. In this tab, you can add additional tasks, preprocessing and post-processing procedures, and parameters. For more information on the Task tab, see About Tasks in the Advanced Scheduling Tool. Note: When a path and FEX name are entered manually into the Procedure field of the Scheduling Tool, the Save As field must also be manually populated. The parameters are populated by clicking the Refresh button in the Task Parameters window. In addition, if you create a schedule with more than one task, you will only be able to specify Email or Printer as your distribution method. Note: If you are working with a schedule with a single task, you can specify any of the above distribution options. Email and printer are the only options for schedules with more than one task specified. Select the appropriate distribution options. For more information, see Distribution Options in the Advanced Scheduling Tool. Never. ReportCaster will not send a notification of the schedule status under any circumstances. This is the default value. Always. Sends a notification each time the schedule runs. Fill in the Reply Address, Subject, Brief Message To, and Full Message To fields. On Error. Only sends a notification when there is an error running the schedule. Fill in the Reply Address, Subject, Brief Message To, and Full Message To fields. In the Log Reports tab, you can view the log reports available for each time the schedule has run. To save the schedule, click Save & Close in the Scheduling tool toolbar.